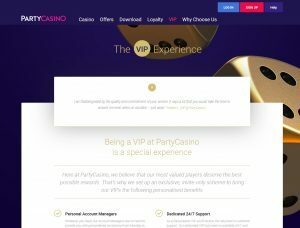 With over 900,000 active customers PartyCasino is one of the biggest and most reputable names in the online casino world, having earned over the years a solid reputation for constant quality of games service. 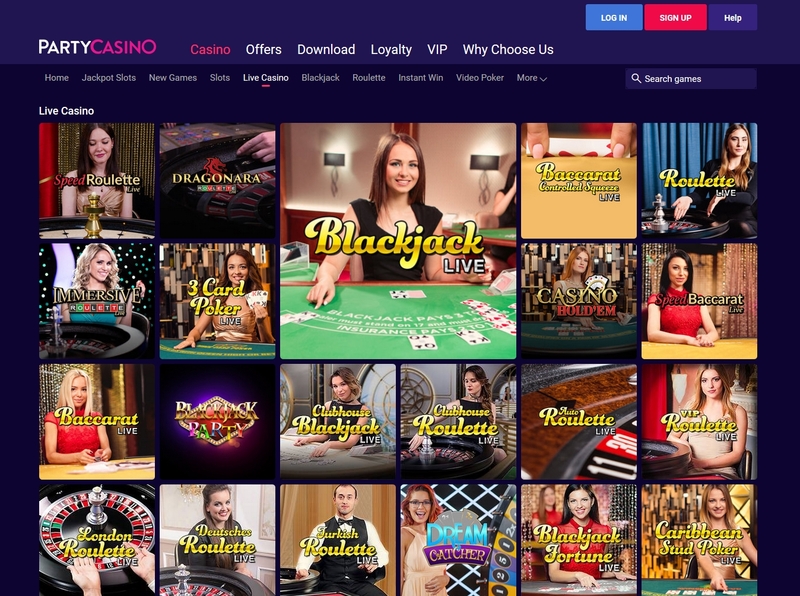 In 2011 the Party Group merged with the world renowned Bwin Group, which has furthered the products and markets which PartyCasino can reach, including for the successful Party Poker site also part of PartyCasino portfolio. Being part of such large business and gaming network provides PartyCasino players with an advantage as they are able to switch between other brands and casinos of the group to enjoy sister Bingo and Poker facilities with a single account. 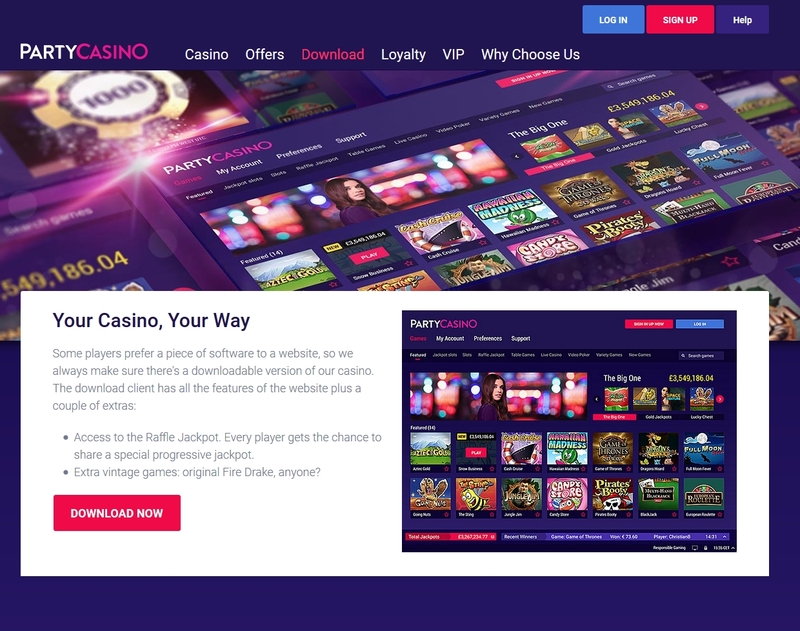 PartyCasino website is extremely easy to navigate and has been professionally designed with customers in mind. The website benefits from strong efforts in the development of new games, as a result PartyCasino game portfolio is both rich and dynamic. Same attention is brought in the domain of deposit and withdraw, with an extremely large choice of payment methods worldwide. 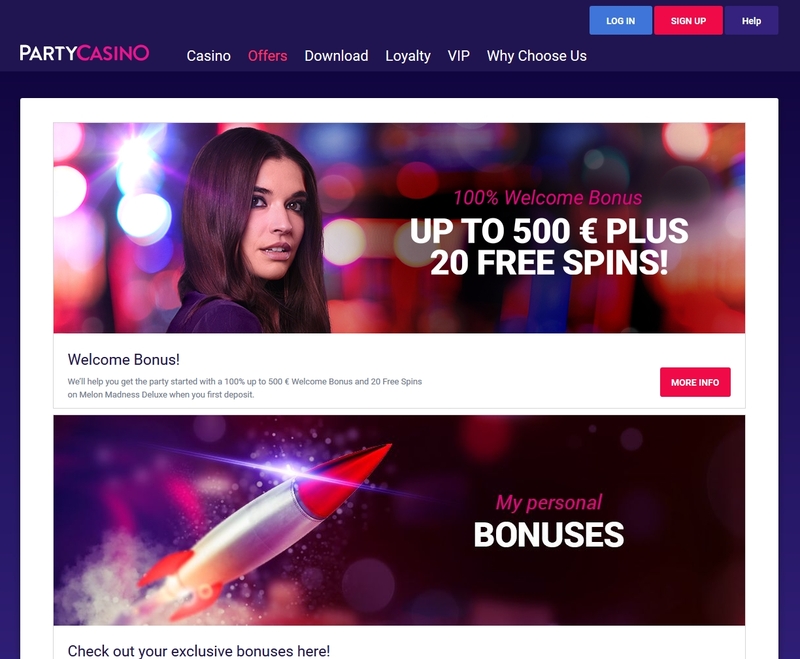 Already one of the largest online casino, PartyCasino keeps attracting new players thanks to its proven trustability and convincing performances, also thanks for its trademark welcome bonus. PartyCasino welcome bonus is one of, if not the most attractive entry incentive in online gambling. It bonus consists of three different elements. On your first deposit they will instantly double the amount you add up to €500. Secondly, you will also be given 20 free spins to play on a slot machine on your mobile or tablet. Finally, on your second deposit with them you will receive the same doubling of your added funds, this time up to €500. 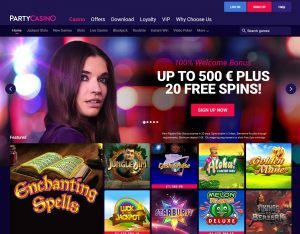 Put together, the welcome bonus thus reaches €500, an amount that leaves the great majority of online casino at least €200 behind. 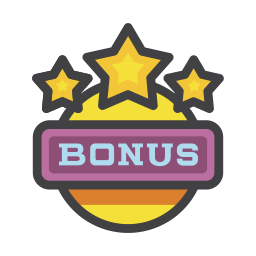 This bonus being reserved to new accounts, Party Casino also provides a guide to activate the different elements of the welcome bonus, so that inexperienced players can easily access these advantages. The software that PartyCasino uses is designed and developed in house which means they do not have to rely on games suppliers and can tailor the games to their exact needs. To be able to do so, PartyCasino joins forces with its umbrella group, allowing for economies of scale in Research & Development. Stronger investment in improving technology results in a higher standard of slot games. As they create the games themselves their customers might lack the huge selection of games that the likes of Microgaming and Net Entertainment provide, but this is compensated in quality of gaming experience. 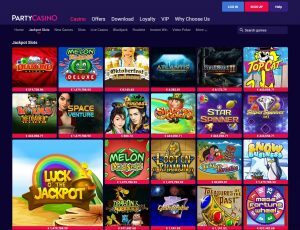 Sticking to the tried and tested and providing quality to their loyal customer base does not keep PartyCasino from proposing a high number of varied games and new games. 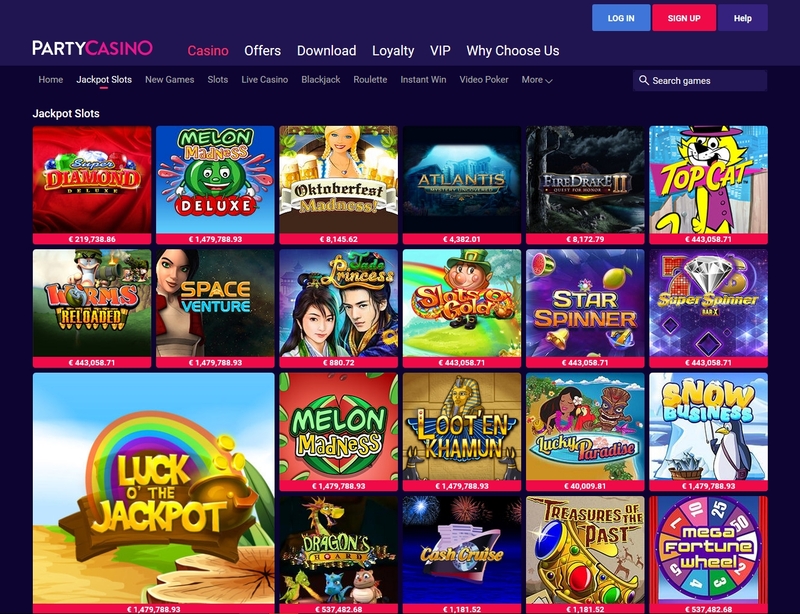 PartyCasino has roughly one hundred slot machine games available to play on. Some of the most popular games available are 20,000 Leagues, Beat the Bank, Bust Da Safe, California Gold, Call of the Colosseum, Call of Duty 4, Modern Warfare, Zeus III and many more. 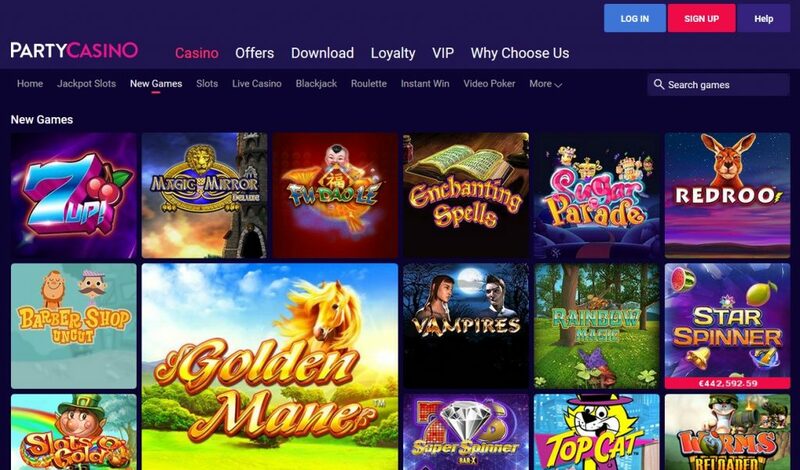 Game portfolio also includes a dozen of live casino games, such as Live baccarat, Immersive roulette and video poker. Mobile gambling experience is accessible on smartphones and tablets by downloading the partycasino app. This app proposes the casino main games such as slots, roulette, blackjack and video poker. Newcomers are welcomed on the app with 20 free mobile spins or a $2.20 poker tournament ticket. The partycasino app can be download on iOS and Android platforms. There are an impressive twenty progressive jackpots to be won, most of which have top prizes in the millions. Jackpots are available in 5 differents categories, covering different level and frequency of gains, from multi-million Pound Big Series jackpots, to Raffle and Ca$h Fla$h jackpots in the couple of thousands. The game that has lead to the biggest ever payout is called Melon Madness. Other jackpot games are Atlantis Mystery Uncovered, Cash Cruise, Space Venture and more. PartyCasino offers a premium service for their most valued customers that is called Paladium VIP. 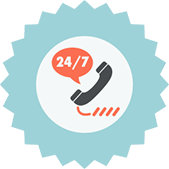 The benefits these customers receive include a 24/7 VIP host who gives direct support. Other benefits include extra birthday bonuses, access to the VIP promotions calendar, higher cashout and deposit limits. Also exclusive games and promotions are accessible only for members, such as the Luck of the Draw with monthly guaranteed prizes. For regular non-VIP players, a pool of hosts is also assigned in the casino to provide help and support. PartyCasino offers a very large list of payment solutions, with dozens of methods across 119 countries. This covers credit and debit cards, bank transfer providers, e-wallers, also PrePaid cards and vouchers. The minimum deposit to start playing for real is very accessible as it is fixed at 10 £. Payout time is generally not more than 3 days, as stated in the casino terms and conditions. All in all Party-Casino is a well established casino company that any player can trust to deliver a qualitative gambling experience. One of the main benefits of this casino is its uniquely high welcome bonus. Coupled with strong promotional schemes and a VIP support service, PartyCasino delivers to the customer a very safe yet exciting place to play.